My name is Meghan. I live in Upper Ojai and our dear friend of 25 years, Ian Graham, has lost just about everything. By spreading his tiny homes between separate canyons, Ian figured at least one of them would be spared in any single natural disaster. 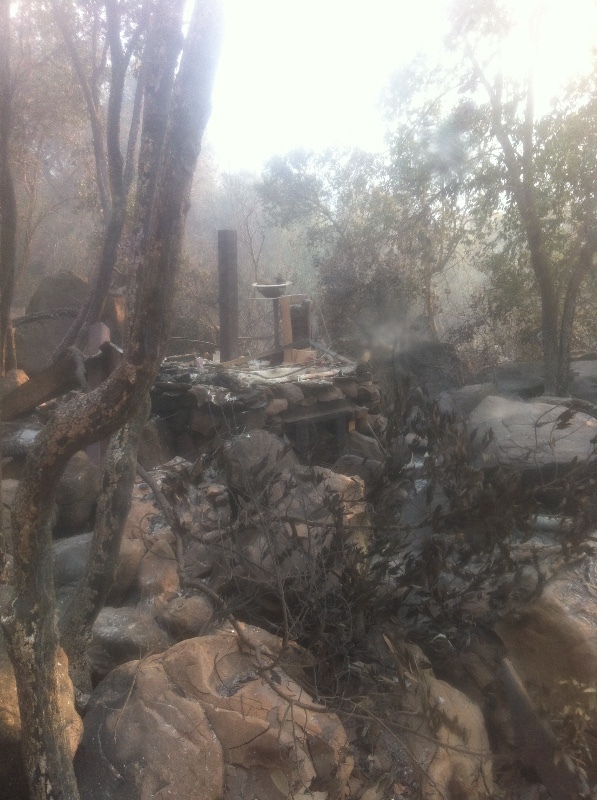 But the Thomas Fire, driven by hurricane force wind and low humidity, burned down both sides of the valley, strangling Upper Ojai and undoing Ian’s lifetime of work in one night. ￼Ian grew up in Wheeler Canyon, where he helped build his family’s house, and by working with his father it instilled a passion for ingenious craftsmanship and design. A dedicated conservationist, he prides himself in using the waste stream to make functional, livable, art by repurposing forsaken building materials. Deep in Sisar Canyon, Ian spent the last six years perfecting a network of cabins, which were built and connected by using 100% reclaimed wood and naturally integrated with the boulder-scape of the canyon. Two weeks before the fire, he drove the final nails into the deck outside his bedroom, which served as an outdoor living space. His bath house was designed around the concept of a wood-fired bathtub, with a sub-floor wood stove to heat water for the cold winter months at 2,700-feet altitude. 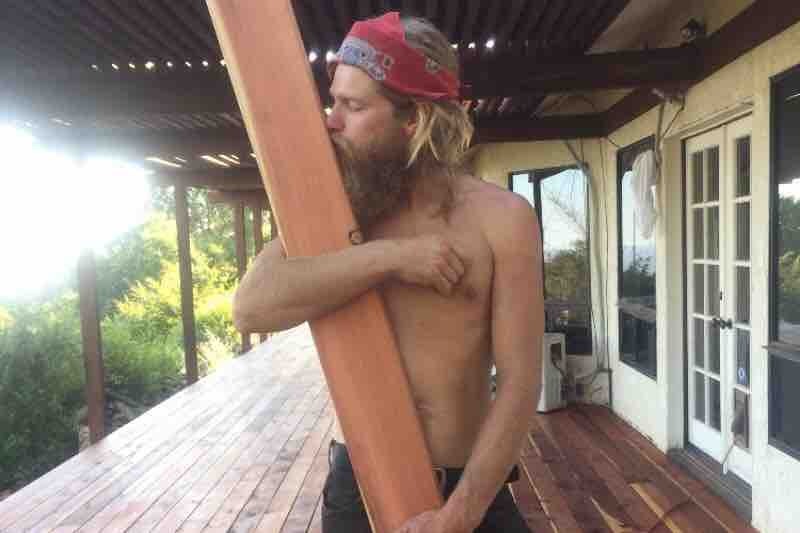 In just two hours, he lost three cabins, a tiny house project, a friend’s school bus he had just renovated, and a yard full of once-in-a-lifetime, priceless hardwoods and materials he spent years salvaging for future construction. ￼ ￼The night of the fire, Ian was on his way to the cabin to surprise his girlfriend, Brieann. He saw the glow of flames in the adjacent canyon and calculated the short time remaining. He alerted Brieann and they escaped with what they could gather, their white German Shepherd, Indy, and their lives. They fled to Full Circle Farm in Upper Ojai, where Brieann lives. Ian helped Brieann evacuate from The Farm before running to attempt to access Wheeler Canyon. Unable to reach his father, who was defending the family home and Ian’s tiny house by himself, he came up against 100-foot flames on the ridge and roadblocks and his Wheeler Canyon structures were lost to the fire. This GoFundMe will enable Ian to restore his tool box and get him back to creating innovative and inventive architecture (he has some new ideas for more fire-resistant projects) and rebuilding friends’ homes. Indy’s burnt paw pads are healing and Ian is already back in Wheeler Canyon, helping his dad replace the plastic culvert pipes that burned in the fire before winter. My name is Meghan and my husband is Josh and he's known ian for 25 years and I for 14. We live in upper Ojai as does Ian. Going directly to Ian and they will help him to restock his tool supplies so he can begin building again. I am writing this so gofundme knows we are real people with true intentions. By spreading his tiny homes between two separate mountain ranges, Ian Graham figured at least one of them would be spared in any single natural disaster. But the Thomas Fire, driven by hurricane force wind and low humidity, burned down both sides of the valley, strangling Upper Ojai and undoing Ian’s lifetime of work in one night. Ian grew up in Wheeler Canyon, where he helped build his father’s house, which ignited a career of ingenious craftsmanship and design. A dedicated conservationist, he prides himself in using the waste stream to make functional, livable, art by repurposing forsaken building materials. 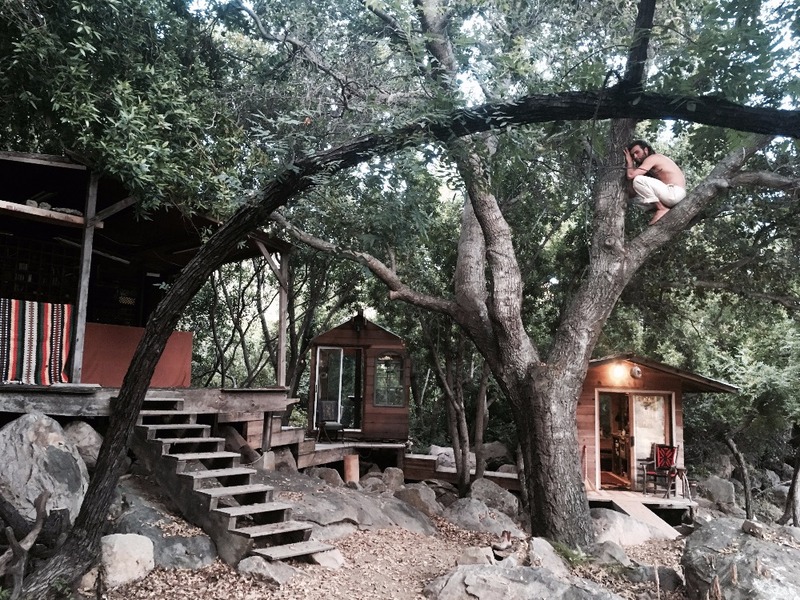 Deep in Sisar Canyon, Ian spent the last six years perfecting a network of cabins, which were connected by reclaimed redwood catwalks naturally integrated with the boulder-scape of the canyon. Two weeks before the fire, he drove the final nails into the bath house, which featured a sub-floor wood stove to heat water for the cold winter months at 3,000’ altitude. 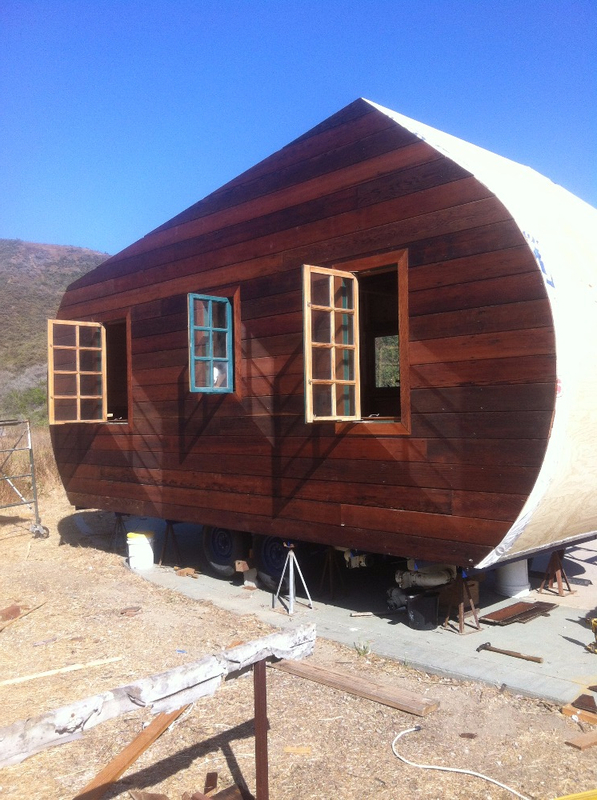 In just two hours, he lost four tiny homes, a school bus he renovated, and a hangar of wood and materials he spent years salvaging for future construction. The night of the fire, Ian was on his way to the cabin to surprise his girlfriend, Brie. He saw the glow of flames in the adjacent canyon and calculated the short time remaining. He alerted Brie and they escaped with a sleeping bag, their lives, and white German Shepherd, Indy. 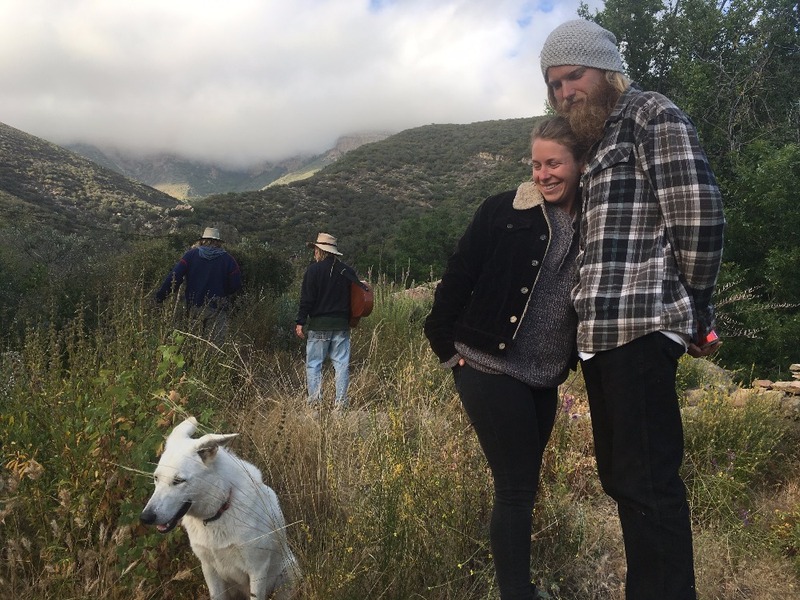 They fled to Full Circle Farm in Upper Ojai, where Brie lives. Ian helped evacuate residents and animals of The Farm before running to Wheeler Canyon to help his father protect his house. This GoFundMe will enable Ian to restore his tool box and get him back to creating innovative and inventive architecture. He has some new ideas for more fire-resistant projects. Indy’s burnt paw pads are healing and Ian is already back in Wheeler Canyon, helping his dad fix his water line before winter. It's been nearly two weeks since this all began. 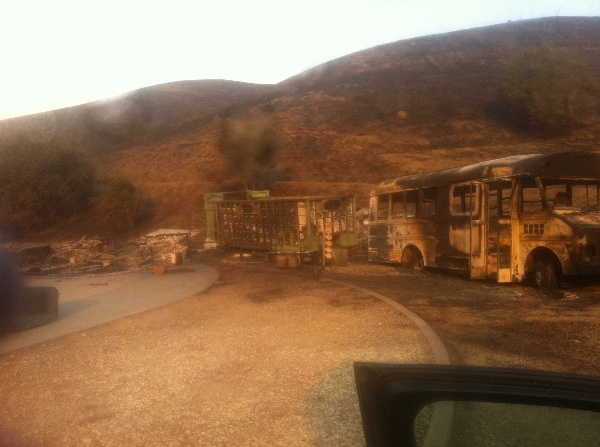 The fire started Monday December 4th. Ian was at his home up Sisar and had moments to get out. He wasn't able to grab more than his dog and his sleeping bag and flee for his life not knowing he would return to ashes. I've known ian for almost 14 years and he is one of the kindest people I know. We lived together for a few years. My husband josh and I lived up in Ian's cabin before him. 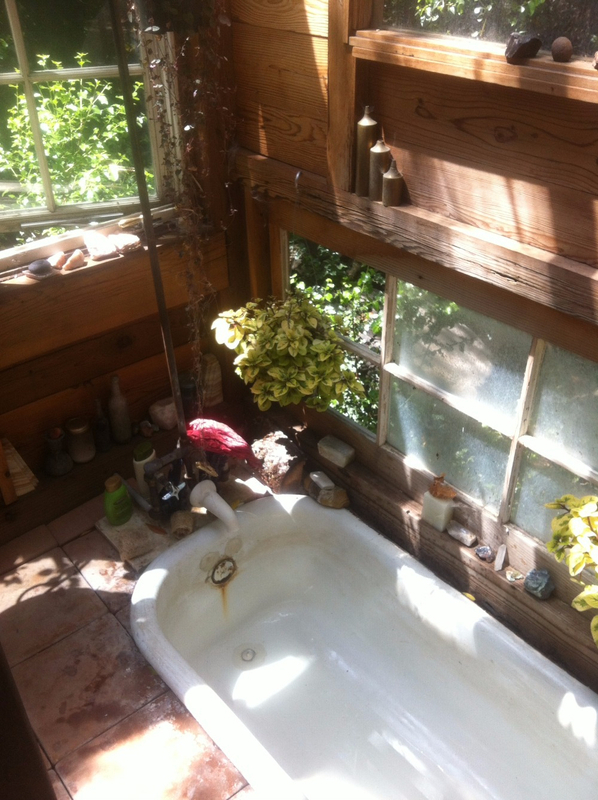 He made beautiful improvements and built a couple tiny cabins there. Hard custom work cannot be replaced but with this gofundme he will be able to get back on his feet again.